Service Spotlight: CNC Turning | KLH Industries Inc.
Editor for Modern Machine Shop Magazine, Chris Koepfer, once wrote, "a shop bought a milling machine to mill, a turning machine to turn, a drill press to make holes and so on." If that shop is KLH Industries, a turning machine with Y-axis live tooling can handle all of those operations - possibly in one setup. A CNC turning center equipped with live tooling is capable of receiving a solid chunk of raw material and - without any handling - can turn, mill, drill, bore, engrave, tap, and thread a ready-to-ship, finished product. The twin-sided live tooling turret can hold up to 24 different tools, removing the need for post-turning operations and additional setups. KLH's turning center also features Y-axis motion, which expands the machining range of live tooling, creating a true four-axis CNC machining center (X-Y-Z and C-axis). What often gets lost during the trip from the lathe to the machining center is the relationship of the holes to the major ID. Very accurate fixturing is needed on the machining center to assure these holes are the correct distance from each other and from the center of the bores...Obviously, on complex workpieces, feature relationships become even more critical. By contrast, single spindle lathes require the operator to machine one end, and then physically rotate the part to machine the other end - increasing labor cost and machine downtime. Other capabilities - such as a bar feeder, parts catcher, chip conveyer, and vapor recovery system - make KLH's turning center extremely cost-efficient for high-volume productions. Imagine turning and milling over a hundred pieces with only a single setup. 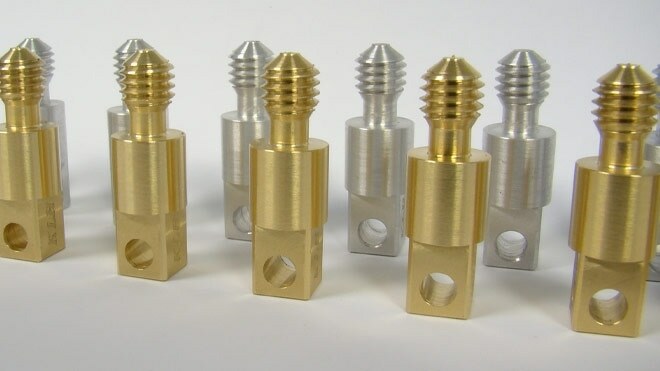 "Even one-shot pieces can see cost benefits in this type of turning center," argues a KLH CNC technician, "I'd bet most rapid prototypes could be benefit from our live tooling with Y-axis." The turn/mill center exemplifies the KLH methodology of "working smarter" by utilizing process integration to reduce setup times, errors, and cost. Visit CNC turning to learn more about turning capabilities, or contact the CNC manager.